The art of placing the successful cold call is most often learned through persistence and dedication. Utmost is confidence to believe in one’s ability to close the deal when offering a valuable product or service. Self-confidence comes through experience and honest self-evaluation. Cold calling may mean one is setting the stage for another to make an in person call or to personally make the visit. The sale of a product may be handled directly over the phone. Perhaps the prospect’s input is all that is required. 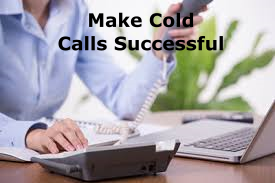 Whatever the circumstance, following are five more tips to maintain and improve adeptness in making cold calls. Get to the decision maker. In most cases, the prospect will not answer the phone. Beginning with the initial contact, practice a compelling tone of voice and use friendly, yet professional tactics. Do not divulge too much information about the purpose of the call; generally, this information should not be delivered through a message. Save the presentation for the decision maker. Monitor voice quality. One’s tone of voice should be calm, friendly and reassuring. Refrain from talking over the prospect. Sound like someone desirable to talk with. The bottom line here is do not sound like a salesperson. Be prepared for the prospect’s questions. Doing one’s homework on the prospective client will provide the caller with a good idea of issues that may be raised. Be ready with answers to questions before they are asked. Take as much time as necessary before the call to anticipate the client’s particular situation and needs. Be organized. Do not waste valuable time searching for files or documents to review before the call. Most successful cold callers can immediately locate a client’s file or information necessary to respond to the prospect’s inquiries. Scripting posted at eye level offers a quick reference. The organized filing system is necessary for the professional caller. Be agreeable. Even though the prospect may have erroneous information, begin your objection with an agreeable tone or word. This allows the prospect to be corrected without feeling he or she may have blundered. “I understand” or “Of course” stated in an obliging manner should precede the attempt to correct the prospect’s misconceptions. Successfully making outbound calls is comparable to riding the proverbial bicycle. Be mindful of whom to speak with, modulate voice tone and acquiesce with prospect. Learn the right tricks and tactics at the beginning of the cold calling career, and reap the rewards throughout.